Dianne Heenan is a Brisbane-based writer working predominantly in memoir. Her current writing project is to tell her family’s story through the lives of individuals and the social forces which shaped them. Dianne completed a visual arts qualification in 1976 majoring in studio ceramics and a teaching qualification in 1978. She then worked full-time as a visual artist and workshop tutor in Brisbane when painting took more prominence in her work. In 1979, she participated in a site specific performance and installation project called Works at the Crypt. It was a group exhibition of installations and performances resulting from a workshop organised by the Institute of Modern Art and run by artist, Jill Scott. It was located on the site of the proposed Catholic cathedral in Gotha Street, opposite Centenary Place. It was the first workshop and art exhibition of this kind in Brisbane. Dianne worked and exhibited in artist’s studios and collectives in Brisbane’s inner city between 1979 and 1985. She rented her first studio space in 1979 from EastAus Art School in Eagle Street, later renamed the Flying Arts School. 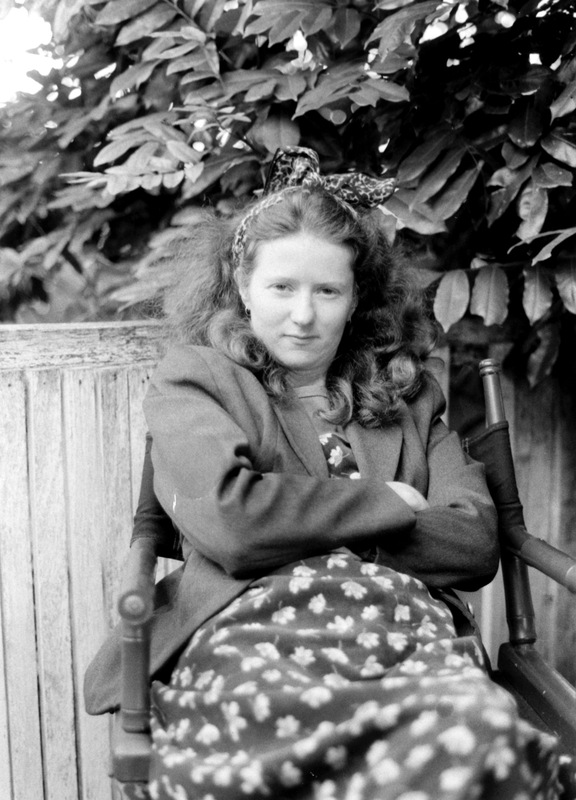 Dianne rented studio space at Red Comb House Project (1982), was a member of A Room exhibiting collective (1984) and a founding member of That Contemporary Art Space (1985). 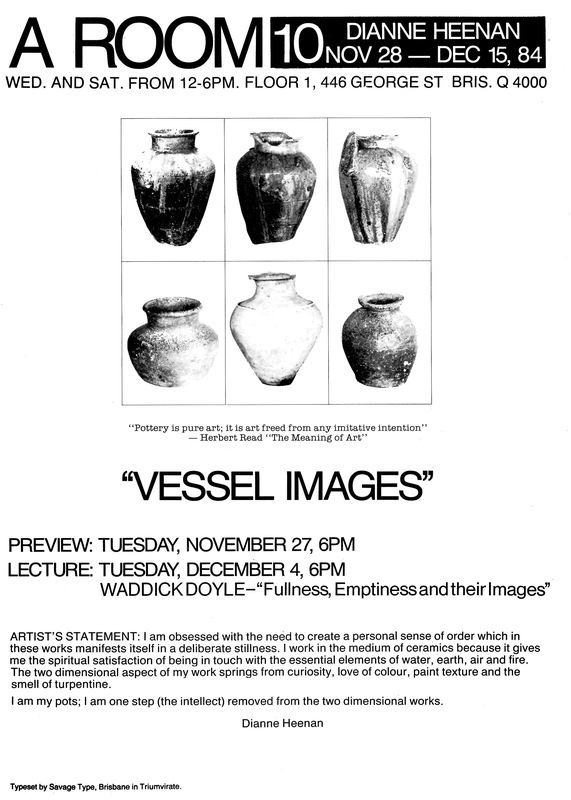 Dianne’s first solo exhibition, Vessel Images was an installation at A Room in December 1984. The ceramic pieces for this exhibition were constructed and fired at the Griffith University Ceramic Studio in early 1984. Dianne designed two stage sets for La Boîte Theatre including Heartbreak House (1978) and Sheik Rattle ‘n Roll for which she also designed the poster (1981). Dianne worked towards the formation of new structures providing opportunities and support for artists. In 1982 she contributed to the development and publication of the first issue of a new art magazine called Artwalk which was the precursor of Eyeline Magazine. In 1984 Dianne was a Committee member of the Queensland Artworkers Union. She exhibited in the Union’s fringe exhibition at Sydney Biennale held in Mark Foys Shop Windows and presented a talk about A Room at the Union’s Visual Arts Conference held in October 1984 at the Brisbane Community Arts Centre. Dianne’s first management role in the visual arts was Co-ordinator at the Cultural Activities Centre at the University of Queensland Union from late 1979 to April 1983. She managed community access facilities for screenprinting, photography and pottery as well as organising a workshop program each semester. She left this position to go to Japan to research pottery techniques and visit ancient pottery kiln sites. After returning from Japan, Dianne worked briefly as a production potter in late 1983 and then for the Queensland Arts Council as Project Co-ordinator for a touring theatre troupe between June and November 1984. In February 1985, Dianne took on the role of inaugural Director of the Gladstone Regional Art Gallery and Museum. Dianne applied the principles of visual arts practice and management from her previous experiences and developed a new model for public art galleries in Gladstone. She introduced a community based management structure, volunteer workers, a Friends Society, a Community Gallery for the display of local artist’s work, an artist’s studio which housed local and visiting resident artists and a traineeship in Museum practice for Aboriginal and Torres Strait Islanders. She facilitated regional arts development and fostered exchanges between regional and Brisbane based artists. For example, she co-curated and exhibited This is That, an exhibition of works by artists from That Space at the Gladstone Regional Art Gallery and Museum and curated an exhibition of works by two central Queensland artists which exhibited in That Space. Dianne was invited to be a member of the organising committee for Stretching the Edges, a national forum on expanding the practices of public art galleries and museums sponsored by the Australia Council and held at the Queensland Art Gallery in February 1990. In 1990 Dianne became director of the Rockhampton Art Gallery where she reformed gallery management practices. She catalogued the collection, improved collection storage, introduced environmental monitoring and upgraded display technology. She introduced new policies to support regional arts practice, collecting works specific to the region and presenting temporary exhibitions of work by regional artists. Dianne was Secretary of the Rockhampton Art Gallery Trust which funded acquisitions and also introduced a Friends Society. Through committee memberships and collaborative projects, she built new bridges between the gallery and the community. Dianne returned to Brisbane in 1995 to renew arts practice and further her education. She held her second solo exhibition, The Sacred Vessel, in 1997 at Gallery Aesthete in New Farm. It included paintings and works on paper made between 1993 and 1997. Dianne was awarded a Master of Arts Research in Sociology in 2000 and then worked for the Queensland Government where she managed research relationships between the government, universities and industry partners. She left this role in 2012 to begin writing full-time. The Activities Centre, Queensland Arts Council, Gladstone Regional Art Gallery and Museum, Rockhampton Art Gallery. McCulloch, Alan (revised and updated by Susan McCulloch),The Encyclopedia of Australian Art, Allen & Unwin, Crows Nest, N.S.W., 2004. McDonald, Lorna, Gladstone…City that waited, Boolarong Press, Brisbane, 1988.